Cat Dissection Atlas with Mammalian Histology and Index is a pictorial guide to domestic cat dissection. Exclusively in e-book format, this title features over 150 high quality color photographs and line drawings. The chapters are broken down into individual organ systems including skeletal, muscular, digestive, respiratory, cardiovascular, nervous, endocrine, urinary and male and female reproductive systems. This e-book provides students with clear, clean dissections accompanied by easy-to-understand text. 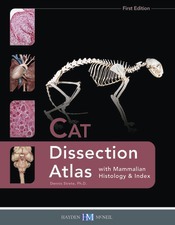 Cat Dissection Atlas with Mammalian Histology and Index is appropriate for majors and non-majors in biology, comparative anatomy, human anatomy, veterinary medicine and high school biology courses."